Visual Studio Online has provided many tools to expand upon past simply serving as a source control repository. From managing work items to providing tools for automated tests and now officially supporting Git, it has grown greatly since its inception. One of the newer and more useful features provided is the ability to write and execute build definitions. These build definitions can be used to deploy code to test and production environments, enable automated unit testing and much more. This blog post assumes you have a basic understanding of Microsoft's Azure cloud hosting platform. The test application created for this blog is hosted in Azure, and that’s the environment you’ll be deploying to. I won't go over the details here, but I’ll assume a web app is created for the application and exists in Azure. Additionally, I’ll be using Git as the source control system for this project. Git is quickly becoming the standard source control system for software development and has gone from being supported by Visual Studio Online to being a first-class citizen. Many of the tools in Visual Studio Online didn’t support Git until recently. 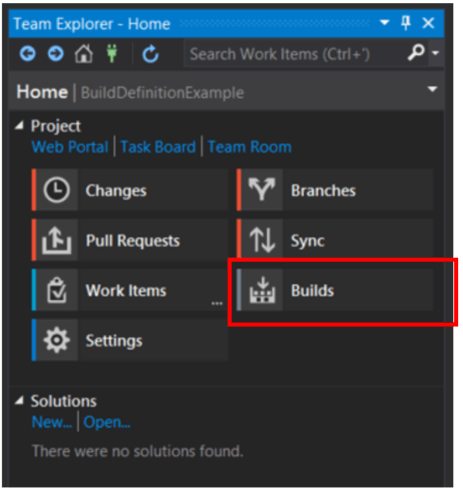 Before moving any further, it makes sense to talk about the advantages of using build definitions for any project hosted in Visual Studio Online. For many projects, build definitions are used as a means to implement Continuous Integration (CI). CI is a practice that works best when developers check in their code to a central repository as frequently as possible, whereas an automated build verifies that a given check-in produces a repeatable build and can then run other steps, such as unit tests, to verify code quality. This automation can be managed using Visual Studio Online build definitions, with steps available to deploy code to Azure, perform unit tests, package code and much more. We’re implementing a very basic example of CI in this example (build each check in and deploy to a test environment), but it’s worth noting that the realm of continuous integration is much more broad than what’s covered here. Once there, you can click New Build Definition to be taken directly to Visual Studio Online. This is where you would start if you had decided to create the build definition directly from Visual Studio Online instead of starting in Visual Studio. Because this is a simple example and we don't need the additional flexibility the Default queue provides, we can leave the default Hosted option selected in the Default agent queue field. For more information on the restrictions on the Hosted pool, see Microsoft’s article on Microsoft-hosted agents. You can see the checkbox for CI at the bottom of the dialog. 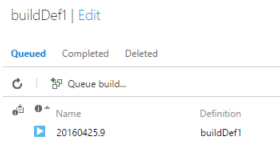 This is enabled so that Visual Studio Online will execute the defined build definition for each check-in. 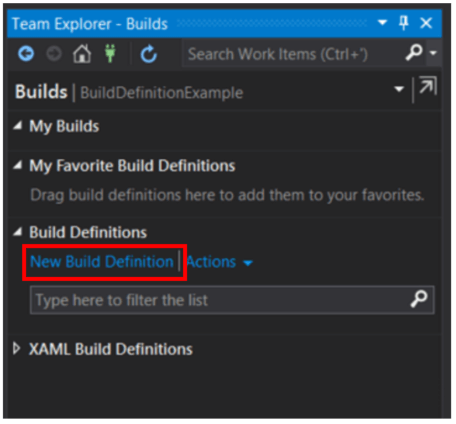 The build definition will define whether or not this build code is published to an environment. Since we want to continually build and deploy to our web environment, we’ll check this box. After clicking Create, you’ll be taken to the Definitions page of the build definition you just created. You’ll see there are already some build steps included by default. For the purposes of this example, we’re creating a build definition that’s very simple and only has four steps: restoring NuGet packages, building, deployment and publishing symbols. There are a few important steps to take to configure your Azure build step. You can choose an Azure Subscription that’s linked to your account or set up a connection using the Manage link to the right of the box with credentials from a publish profile. You also need to make sure you enter the name of the web app you want to deploy to. This tells the deployment to look in the staging directory for the artifacts produced by the Visual Studio build step. If not configured properly, the Azure deployment step won’t be able to find a deployment package, and the build will fail. Once the build has succeeded, you can navigate to your web app and verify the change has been pushed to the web app. 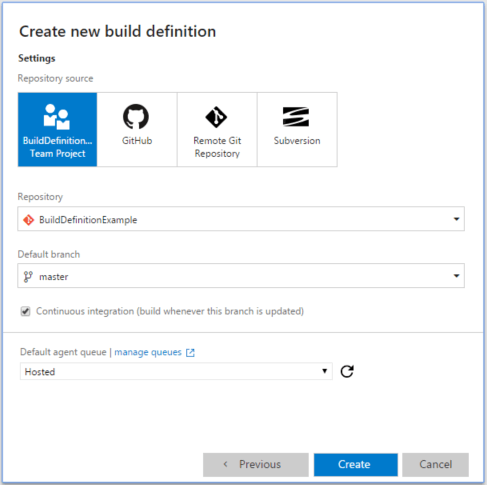 Hopefully, this blog post has helped you understand how you can leverage Microsoft Azure build definitions to implement a CI process for your applications that are hosted in Visual Studio Online. This article originally appeared on May 19, 2016.